The Money Enigma is a dedicated to the development of new economic theories regarding price determination and the nature of money. The Money Enigma discusses these theories and their practical application in a weekly newsletter. Please sign up for the weekly newsletter or follow us on twitter. The view of The Money Enigma is that every price is a function of two sets of supply and demand. Price is a relative measurement of the market value of two goods: the market value of a primary good (good A) relative to the market value of a measurement good (good B). 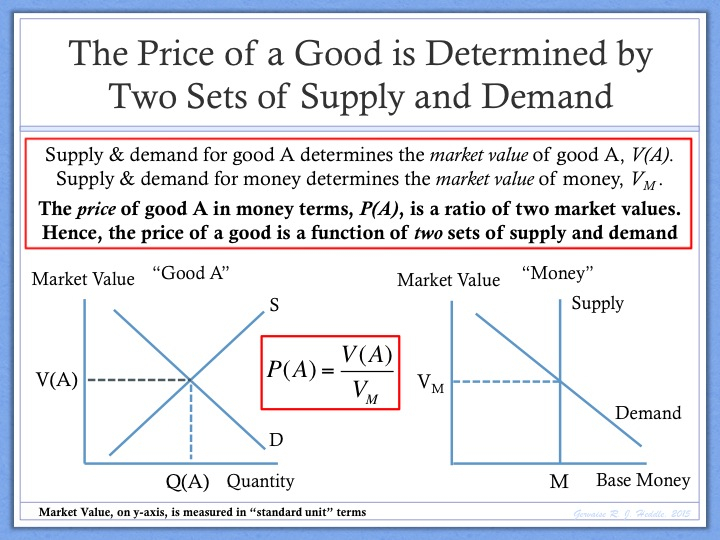 The market value of the primary good is determined by supply and demand for the primary good. The market value of the measurement good is determined by supply and demand for the measurement good. 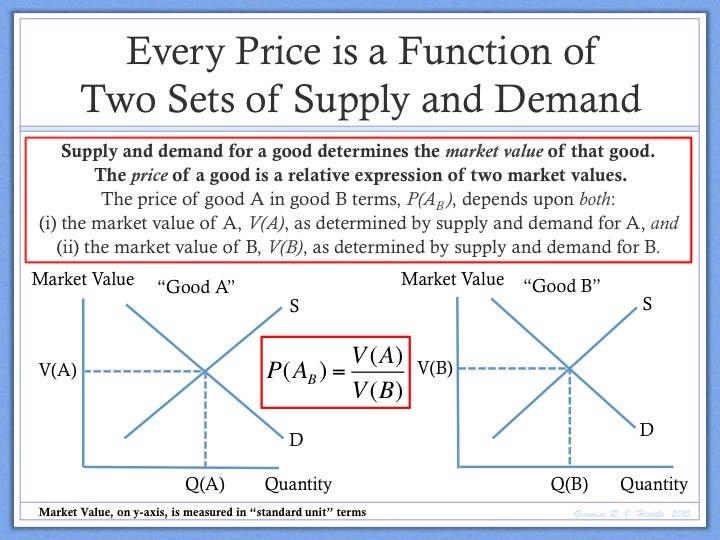 The price of the primary good, in terms of the measurement good, is a function of two sets of supply and demand: supply and demand for the primary good and supply and demand for the measurement good. This theory can be most easily understood in the context of a barter economy. 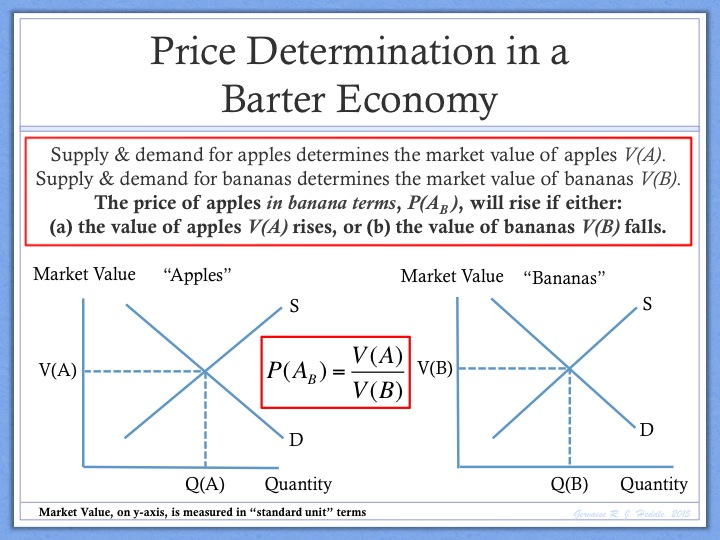 For example, is the price of apples, in banana terms, a function of supply and demand for the primary good (apples) or supply and demand for the measurement good (bananas)? The view of The Money Enigma is “both”: the price of apples, in banana terms, depends upon both supply and demand for the primary good (apples) and supply and demand for the measurement good (bananas). In a money-based economy, the measurement good most commonly used is money. The view of The Money Enigma is that supply and demand for money (the monetary base) determines the market value of money. In turn, the market value of money is the denominator of every “money price” in our economy. This theory represents a direct challenge to existing economic theory which states that supply and demand for money determines the interest rate. 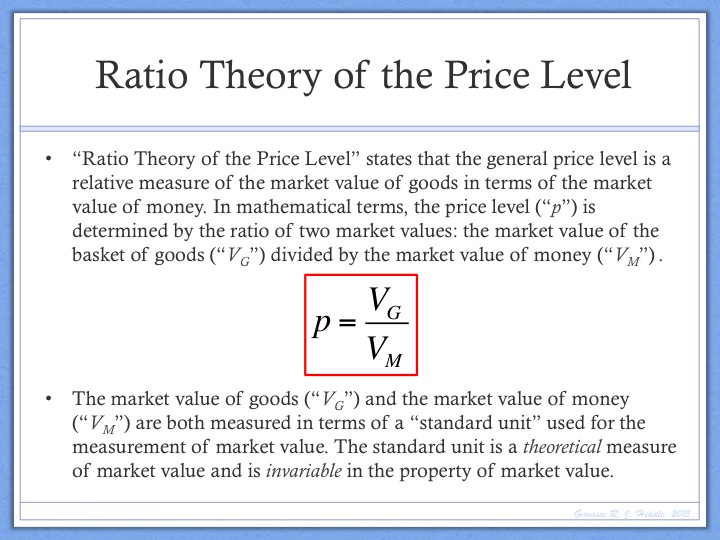 The Money Enigma extends this microeconomic theory of price determination to a macroeconomic theory of price level determination called “Ratio Theory of the Price Level”. Ratio Theory states that the market value of money is the denominator of the price level. The price level can rise either because (a) the market value of the basket of goods rises, or (b) the market value of money falls. If the price level is dependent upon the market value of money, then this raises an obvious question: what determines the market value of money? In order to answer this question, we need to ask some fundamental questions regarding the nature of money. In particular, why does fiat money have value? In order to understand why fiat money has value, we need to step back and think about why any asset has value. 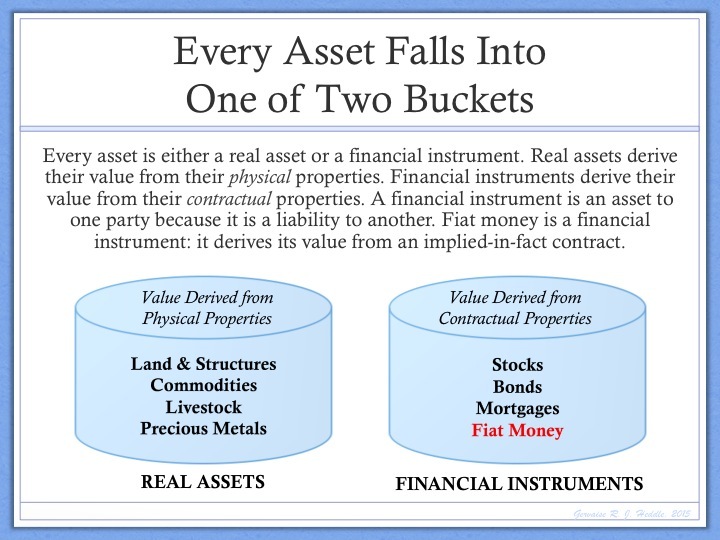 Every asset is either a real asset or a financial instrument. Real assets derive their value from their physical properties. Financial instruments derive their value from their contractual properties. (Financial instruments have value to their holder because they represent a liability to another party). The view of The Money Enigma is that fiat money only has value because it is a financial instrument. More specifically, fiat money represents a proportional claim on the future output of society (“Proportional Claim Theory”). 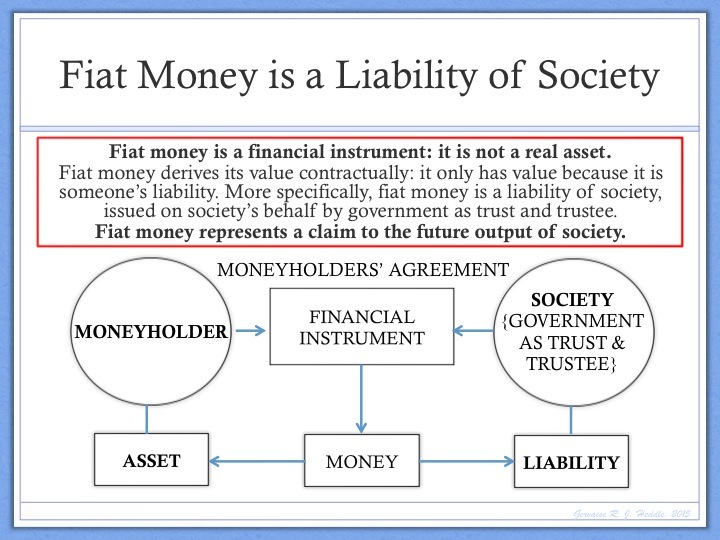 Proportional Claim Theory states that fiat money is a financial instrument that derives its value from an implied-in-fact contract: fiat money only has value (is an asset to its holder) because it is a liability of society. More specifically, fiat money is a long-duration, special-form equity instrument issued by society and represents a proportional claim on the future output of society. 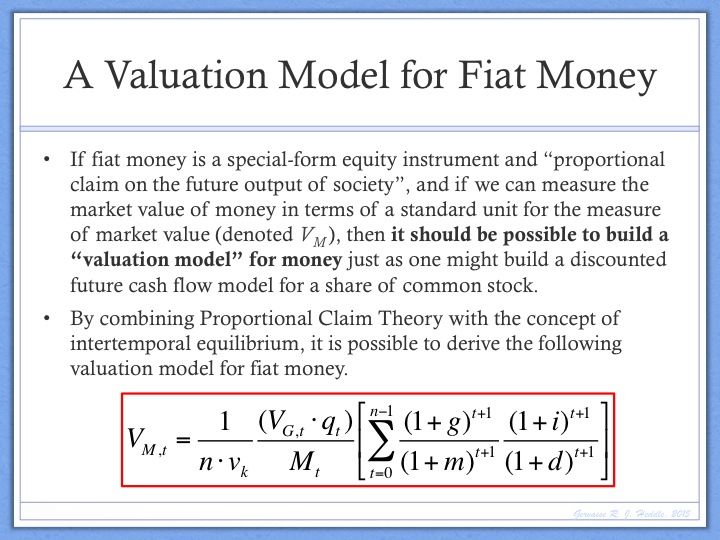 While fiat money does not share all of the characteristics of a traditional equity instrument (for example, fiat money entitles the holder to a slice, not a stream, of future economic benefits), one characteristic that fiat money does share with traditional equity is that its value is highly dependent upon long-term expectations. More specifically, the long-duration nature of fiat money means that its market value depends upon 20-30 year expectations of key economic variables such as real output and the monetary base. We can use this theory to build an expectations-based valuation model for money. In many ways, this model is very similar to a discounted future cash flow model that one might use to value any other financial instrument. While this model may look complicated, its key implication is simple: the value of fiat money primarily depends upon confidence in the future economic prospects of society. The market value of money will fall if expectations for long-term output growth fall or if expectations for long-term monetary base growth rise. If the finances of a society begin to deteriorate and both of these expectations begin to manifest, the market value of money falls and the price level rises. What makes this valuation model for money so interesting is that it can be used to develop expectations-based solutions for the price level, the velocity of money and foreign exchange rates. The model for the price level illustrated opposite is derived from the valuation model for money illustrated above. The view of The Money Enigma is that the price level can be broken down into a “baseline component” that reflects current economic conditions and an “expectations component” that reflects expectations regarding the long-term economic prospects of society. 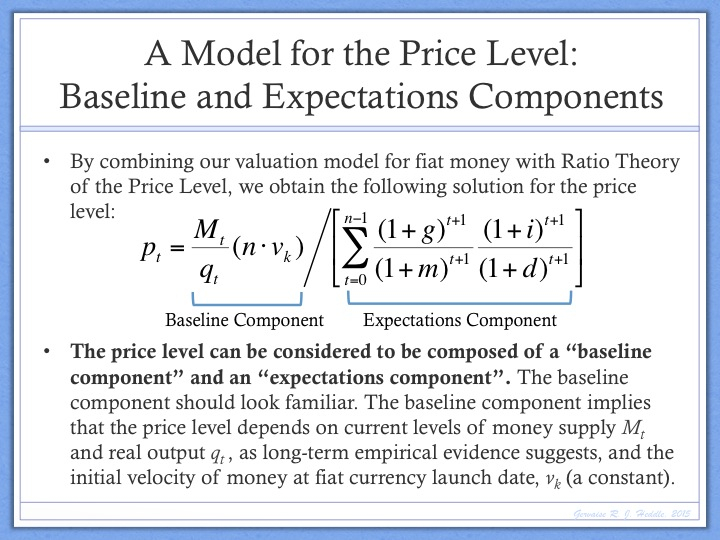 Importantly, this model for price level determination can be used to explain why the quantity theory of money works in the long term, but not in the short term. The Money Enigma discusses all of these theoretical concepts and their application to markets and policy-related issues in a weekly newsletter. You can sign up to receive the weekly newsletter by entering your name and email in the space provided on the right sidebar. Those readers looking for a more detailed discussion of these theories should read The Enigma Series, a series of presentations that discuss all of these issues in detail. You can click here to download the Executive Summary and Overview for the The Enigma Series.